I have a confession to make. We didn’t have bridesmaids at our wedding. And you know why? Because I think the wedding industry has this whole “Bridesmaid” concept all wrong. Even if Kristen Wiig has it all right. Thanks to years of indoctrination by wedding magazines and TV shows, it’s easy to stop seeing our bridesmaids for what they are: a bunch of girls who we love so much that we ask them to stand up for us while we make enormous vows. Nope. That’s not what bridesmaids are! (Silly.) Instead, we’ve come to view bridesmaid-dom as the ultimate friend contest. It’s a time for our girlfriends to prove how much they love us by throwing us showers and bachelorette parties and dropping everything else in their lives to help us during the grueling 18 months leading up to our wedding day. Also, bridesmaids are accessories! Obviously! On your wedding day, they’ll prove what good taste you have by standing up there arrayed in gorgeous outfits (though, obviously, not outfits that are prettier than yours, duh). Everyone will look at you, with your chic friends and know that you have a very, very great life. 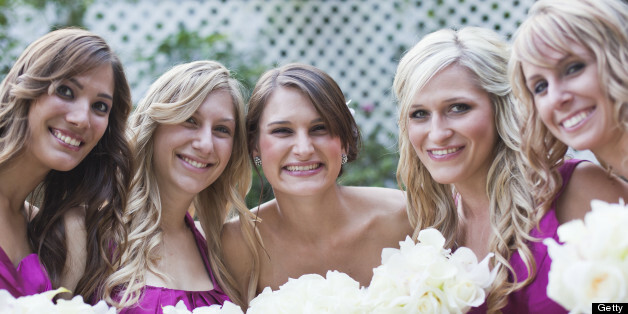 You know how I know that the wedding industry has it dead wrong when it comes to bridesmaids? Because the number two tip you’ll hear for cutting your wedding budget (after the loathsome “cut the guest list” tip, which deserves its own post) is “If you need to cut your wedding budget, cut your bridal party. You’ll save money on gifts and expenses.” As if you’d want one of your best girlfriends to not ask you to stand up for her on her wedding day because she couldn’t afford to buy you a silver frame, or matching pearl earrings, or whatever gift you’re going to be touched by, but probably never use again. All this leads me to believe that the wedding industryrather profoundly misunderstands the idea of friendship, because it looks at friendship (like it looks at everything else) as a commodity.